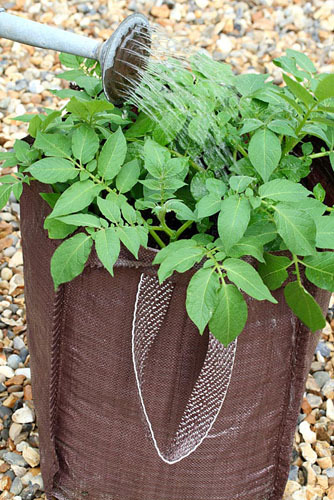 You can get a surprisingly large haul of delicious new potatoes by growing them in a simple sack on your patio. What’s more, if you plant them in August or September, you could be harvesting them on Christmas morning! Generally speaking however, first early potatoes planted in February can be ready around 10 weeks from the planting date, while second earlies take a fortnight longer. Maincrop potatoes, planted from March to mid May, usually take around 15 to 20 weeks to harvest. To speed up the process (especially with first and second earlies), people often ‘chit’ the potatoes. This simply involves placing each tuber in an individual hollow of an egg box or seed tray, with the eyes facing upwards. Place the tray in a cool, bright, frost-free position. You’ll soon notice lots of little sprouts appearing. 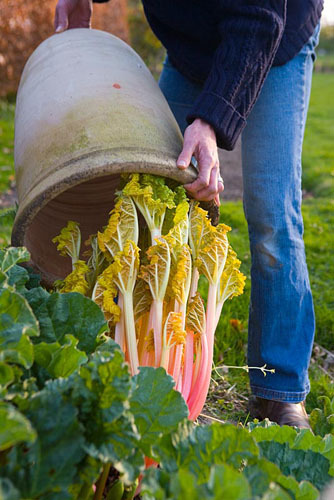 Once they’ve chitted, fill your bag up to a third high with organic compost. Place a couple of chitted potatoes on top, then fill another third and add two more. Finally fill to the top with compost, and water thoroughly. If the bag is placed in a sunny position, green sprouts will soon be visible over the top of the compost. Water regularly and feed with potato fertiliser every fortnight. The time it takes to harvest varies according to the type of potato you planted and whether you want baby new potatoes or you’d rather wait for larger tubers. Once your plants begin to flower, it’s a good sign that the first earlies can be harvested as new potatoes. 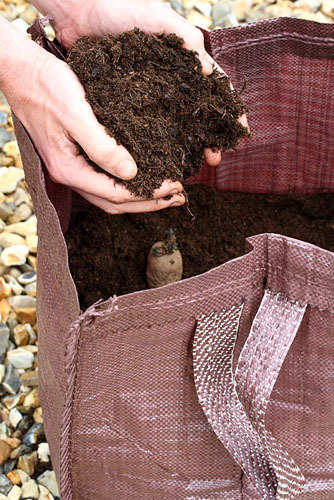 If you gently scrape away some of the soil at the top of the bag, you’ll see how large the tubers are – if they’re still too small, cover them back up with compost and wait another fortnight. 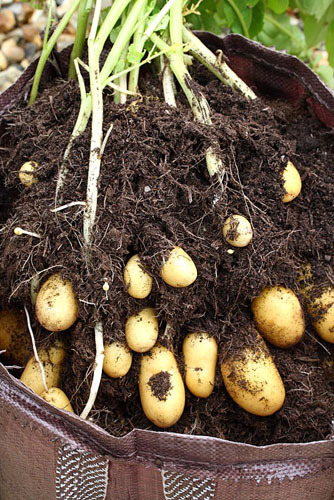 Maincrop potatoes are generally left for a fortnight or more after the foliage has started to dry up and die back. If foliage is turning yellow or brown you can cut it with secateurs and add it to the bonfire. Avoid composting potato foliage as this can spread blight. When the potatoes are ready to harvest they should be spread regularly throughout the bag. A great advantage of growing them this way is that they are very unlikely to be damaged by pests such as slugs and eelworms – so almost every tuber will be blemish free. Carefully check through the entire bag as there are bound to be a few elusive marble-sized spuds. Brush off any lumps of compost. You may want to eat some of your harvest right away, but place the other tubers in a dry, airy spot to allow the skin to harden and dry out. Then you can store them in hessian sacks or paper bags. Avoid using polythene bags to store potatoes as this encourages them to rot. Click here to view all the images from this feature. 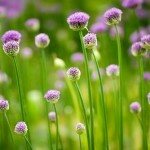 This entry was posted in Practical gardening on February 28, 2014 by gapadmin. Blanching is an ancient gardening technique which is surprisingly easy and effective. 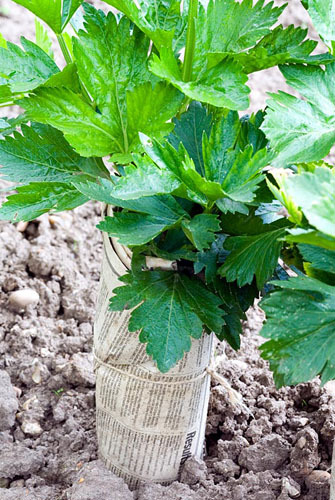 Pots, soil or even cardboard tubes are used to prevent light from reaching the young shoots of certain plants. This means that they rapidly stop producing chlorophyll. Over a few days or weeks this change in their chemistry means that they gradually become paler, not to mention more tender. They are also often triggered into growing quickly in an attempt to reach up towards the light. The stems and leaves tend to be milder and sweeter as a result, so this is a popular technique for bitter vegetables. The first blanched rhubarb stems of the year are an eagerly-awaited treat. Covering established plants with a terracotta forcer brings on an early crop of extra-sweet and slender stems. Forcing celery helps to create taller, milder stems which are delicious raw. Fold a sheet of newspaper into quarters and wrap it around the stems of each plant before tying with string. The mild white stem of a leek is the most succulent part. 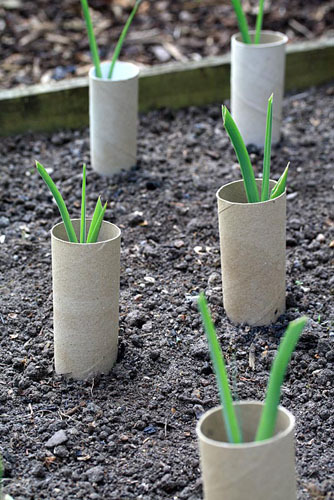 You can blanch leeks by simply pushing a toilet roll tube firmly into the soil over the stem of each young individual plant. Water well. The distinctively spicy flavour of chicory can be too much for many palettes. 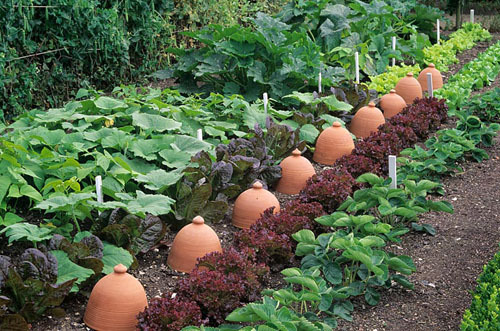 Covering young plants with forcing pots gives the leaves a much milder flavour whether eaten raw or cooked. 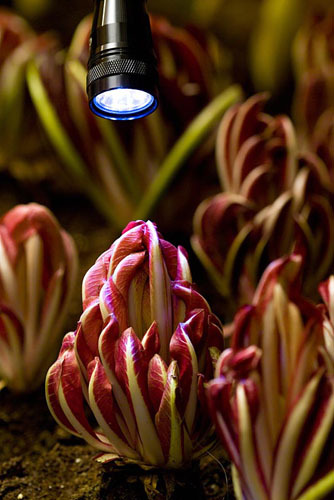 If you want to force a large crop of a vegetable such as chicory, you can use a forcing shed to exclude light. 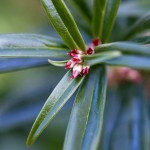 The tender leaves can be harvested from early December through to February. This entry was posted in Expert advice on February 26, 2014 by gapadmin. There is so much unfolding in our gardens in spring that every trip outside will reward you with a new visual feast. The sight of fresh ferns (such as Polystichum setiferum) unfurling is a magical reminder of the myriad shades of green we can all enjoy in our gardens. Contrasting leaf shapes are also delightful, as Polygonatum stems emerging through Geranium foliage demonstrate. 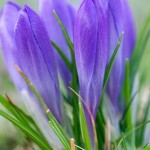 The fresh new petals of Crocus tommasinianus can be almost jewel-like as they glisten in the early sunshine. When the sun is high in the sky at midday, they open their petals out into a star shape, gradually closing them up again as the light fades. 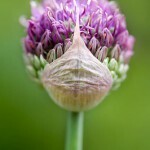 Alliums such as ‘Purple Sensation’ open gradually from a tight lollipop shape until they resemble a sparkler, with a multitude of vibrant stars atop hundreds of tiny stalks. Other plants have a more subtle beauty. 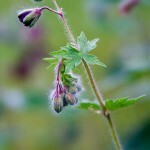 The flower buds of Pulsatilla vulgaris and Geranium ‘Samobar’ are covered in countless fine hairs, giving them an ethereal glow. 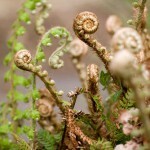 Some sights need to be viewed close up for you to really appreciate their intricate wonder. 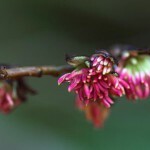 Parrotia persica (also known as Persian ironwood) has magenta-pink flowers that resemble tiny sea anemones. The dainty flowers of Sarcococa hookeriana make a brilliant contrast against the glossy emerald foliage. 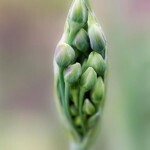 But for sheer simplicity of architectural form, it’s hard to beat the emerging buds of Nectaroscordum siculum. 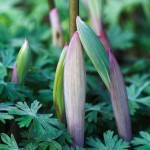 Nestling together under a wispy papery casing, they gradually push outwards into the light, opening up into the familiar graceful nodding umbels of creamy pink flowers. This entry was posted in Seasonal, Spring on February 24, 2014 by gapadmin.